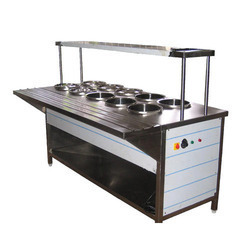 We are engaged in offering an extensive range of Hot Food Service Counter, which is available in different models and capacities. It is designed using quality material and is considered best to keep food fresh. Easy to use and maintain, it is cost effective and conforms to the international quality standards. We are looking for queries for Steel Kitchen Equipment And Accessories from Tamil Nadu, Kerala, Karnataka & Andhra Pradesh. We are offering the wide range of Hot Food Service Counter to our valuable clients. Looking for Hot Food Service Counter ?